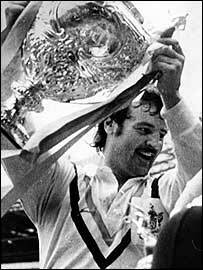 Alex Murphy insists Leigh's shock win over Leeds in 1971 is the sweetest of his Challenge Cup final successes. The irrepressible Murphy is the only player to captain three different sides to victory in the competition. He led St Helens to success in 1966; followed that up with a win over Leeds as both player-coach of Leigh five years later; then lifted the trophy as Warrington's player-boss in 1974. But it was Leigh's victory that gave him the most pleasure. "A lot of people underestimated that Leigh side but we had some outstanding players in David Eckersley, Kevin Ashcroft and David Chisnall," Murphy told BBC Sport. "Leeds were 5/1 on to win the Cup. They also had a side loaded with internationals. "But the way we approached the final was tremendous and we won the match well. "That win probably gave me the greatest pleasure of any win at Wembley." Murphy wasn't on the pitch when the final hooter went. He had been stretchered off after being headbutted by Leeds captain Syd Hynes on 65 minutes, by which time Leigh were already well on the way to victory. "Syd told me on the morning of the game that he and his team were on £5,000 a man to win the Challenge Cup," Murphy recalled. "So I think he got a little frustrated when he could see that it was not going to happen. "People said that I feigned injury and that I winked when I was on the stretcher. "Well, I can honestly say that I might have blinked but I didn't wink! I really did take a knock and woke up in the dressing room being attended to by the Wembley doctor." Murphy also delights in St Helens' defeat of Wigan in 1966, which gave him the first of his Challenge Cup successes. "When I captained Saints to victory over Wigan, we had a team of stars who could score from anywhere on the pitch," he told BBC Sport. "It turned out to be a comfortable victory, but the most pleasing aspect for me that day was to see our South African winger, Len Killeen, kick a penalty goal from 65 yards out. "No-one expected him even to attempt a kick at goal, never mind grab two points. "But in training during the week, I had seen him kick a similar goal and he told me to give him a chance if ever Saints were awarded a penalty in a similar position at Wembley. "We got such a chance, I told him to try for a goal, and he kicked it. It was a great thrill."